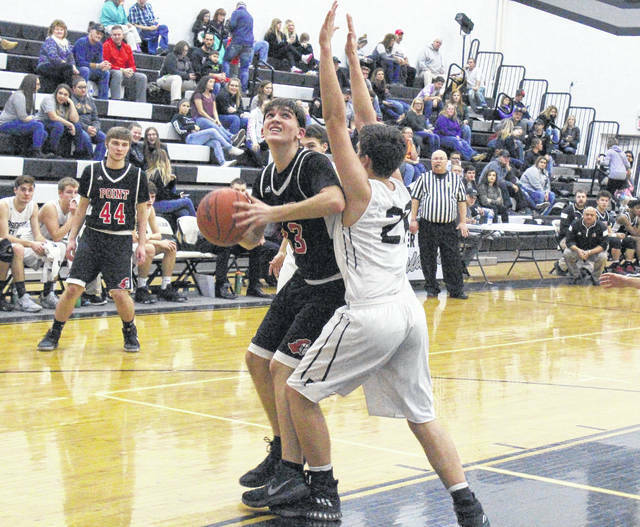 Point Pleasant sophomore Kade Oliver makes a post move around a River Valley defender for a shot attempt during a Jan. 9 boys basketball contest in Bidwell, Ohio. CHARLESTON, W.Va. — Sophomore Kade Oliver was the lone selection for Point Pleasant on the 2018 Class AA all-state boys basketball team, as voted on by members of the West Virginia Sports Writers Association. Oliver — a 6-foot-3 forward — paced the Big Blacks with 10.3 points and also averaged 6.0 rebounds, 2.0 assists and a block per outing while connecting on 58 percent of his field goal attempts. PPHS finished the 2017-18 campaign with a 3-19 overall mark. It is the first all-state selection for Oliver in basketball as the sophomore was chosen to the honorable mention list. Taevon Horton of Fairmont Senior was named the first team captain, while Mookie Collier of Bluefield was the second team captain. Cole Whited of Philip Barbour was chosen as the third team captain. On the girls side of Class AA, no members of the Lady Knights were chosen to the all-state list after finishing the 2017-18 campiagn with a 1-19 overall mark. Gabby Lupardus of Wyoming East was named the first team captain, while Anna Hamilton of Nicholas County was the second team captain. Autumn Spangler of Bluefield was chosen as the third team captain. Taevon Horton, Fairmont Senior (captain); Drew Williamson, Chapmanville; Zyon Dobbs, Fairmont Senior; Obinna Anochili-Killen, Chapmanville; Jalen Bridges, Fairmont Senior; Jude Akabueze, North Marion; Jeremy Dillon, Mingo Central; David Shriver, Philip Barbour. Mookie Collier, Bluefield (captain); David Early, Logan; Shane Jenkins, Westside; Braeden McGrew, Winfield; Andrew Work, Oak Hill; Joel Sweat, Nitro; Corey Hatfield, Westside; Luke LeRose, Nicholas County. Cole Whited, Philip Barbour (captain); Cole Browning, Braxton County; McQuade Canada, Wyoming East; Colin Breeden, Berkeley Springs; Qwailei Turner, Nitro; McKinley Mann, James Monroe; Keyshawn Faulks, Weir; Tayton Stout, Braxton County. Michael Beasley, Oak Hill; Tanner Bifano, Bridgeport; Caleb Bish, Grafton; Grant Bonner, Herbert Hoover; Jake Bowen, Bridgeport; Kyle Browning, Chapmanville; Terrance Chapman, Logan; Zach Cook, Man; Braden Crews, Bluefield; Jacob Ellis, Westsdie; Cory Fazalare, Lincoln; Jack Faulkner, Grafton; Jon Hamilton, Scott; Alex Harvey, East Fairmont; Jonathan Hatcher, River View; Drew Hatfield, Mingo Central; Devin Heater, Roane County; Cole Honaker, Shady Spring; R.J. Hood, Wyoming East; Jalen Hudson, Liberty Raleigh; Andrew Huff, Winfield; Tanner Huffman, Nicholas County; Triston Hulderman, North Marion; Dasilas Jones, Fairmont Senior; Tanner Kennedy, Robert C. Byrd; Chris Kokoski, Oak Glen; Broderick Lantz, Liberty Harrison; Jonathan Leep, Lincoln; Brayden Lesher, Bridgeport; Levi MacAdam, Philip Barbour; Jesse Maddox, East Fairmont; Andrew Mahairas, Nitro; Corey Marcum, Wayne; Darrick McDowell, Oak Hill; Evan McKneely, Poca; Peyton Meadows, PikeView; Khori Miles, Robert C. Byrd; Shawn Moran, Lewis County; Gunner Murphy, North Marion; Dino Noe, Logan; Nick Nutter, Nicholas County; Kade Oliver, Point Pleasant; Hunter Pool, Petersburg; Noah Price, Philip Barbour; Reed Reitter, Weir; Kolbe Rogers, Winfield; Nate Samples, Sissonville; Kyle Saunders, Independence; Ryan Shoemaker, Keyser; Dylan Smith, Chapmanville; Ethan Travis, Oak Glen; Tanner Walls, Lincoln County; Dalton Westfall, Liberty Harrison; Zack Whitacre, Frankfort; Eliot White, Elkins; Steven Williams, Shady Spring; Isaac Workman, Clay County. Gabby Lupardus, Wyoming East (captain); Gracey Lamm, Lincoln; Aeriel Adkins, Wayne; Emily Saunders, Wyoming East; Hannah Shriver, North Marion; Abby Beeman, Frankfort; Baylee Goins, Nitro; Laila Arthur, Sissonville. Anna Hamilton, Nicholas County (captain); Lucille Westfall, Roane County; Kara Sandy, Wyoming East; Jazz Blankenship, Wyoming East; Z.Z. Russell, Winfield; Jasiah Smith, Bluefield; Maddie Wilcox, Wayne; Angela DeLorenzo, Fairmont Senior. Autumn Spangler, Bluefield (captain); Taylor Buonamici, North Marion; Holly Toler, Logan; Laken McKinney, PikeView; Emily Riggs, Bridgeport; Katie Ball, Mingo Central; Kiersten Roberts, River View; Allison Dunbar, Herbert Hoover. Lakyn Adkins, Wayne; Shiloh Bailey, PikeView; Kierra Bartholow, East Fairmont; Kaylee Blair, Chapmanville; Erica Boggs, Clay County; Lexi Bolen, Independence; Kara Browning, Chapmanville; Hannah Boyd, Scott; McKenzie Carpenter, Philip Barbour; Taylor Carpenter, Herbert Hoover; Auburey Chandler, Poca; Adriana Christopher, Philip Barbour; Maliyah Cottingham, Liberty Harrison; Jade DeBerry, Lincoln; Makenna Douthitt, Frankfort; Reece Enochs, Oak Glen; Abby Faulkner, Fairmont Senior; Emily Hudson, Winfield; Makayla King, Oak Hill; Maggie Kovalcik, Oak Glen; Jayden Lindsey, East Fairmont; Kearstin Lucas, Keyser; Gracie Mann, James Monroe; Rory Marple, Bridgeport; Makayla Morgan, Westside; Cara Minor, North Marion; Brielle Osborne, North Marion; Emily Parker, Nicholas County; Leah Parrish, North Marion; Ally Peters, Grafton; Bella Posey, Lewis County; Sarah Post, Lewis County; Torri Potterfield, Nitro; Xziah Rhodes, Mingo Central; Whintey Sansom, Wayne; Kaitlin Smith, Bridgeport; Bailey Stead, Weir; Jill Tothe, Logan; Anna Tucker, Lewis County; Lexi Turner, Keyser; Gillian Weaver, Robert C. Byrd; Brittney Welch, Logan; Courtney Wilfong, Fairmont Senior; Brynne Williams, Lincoln.